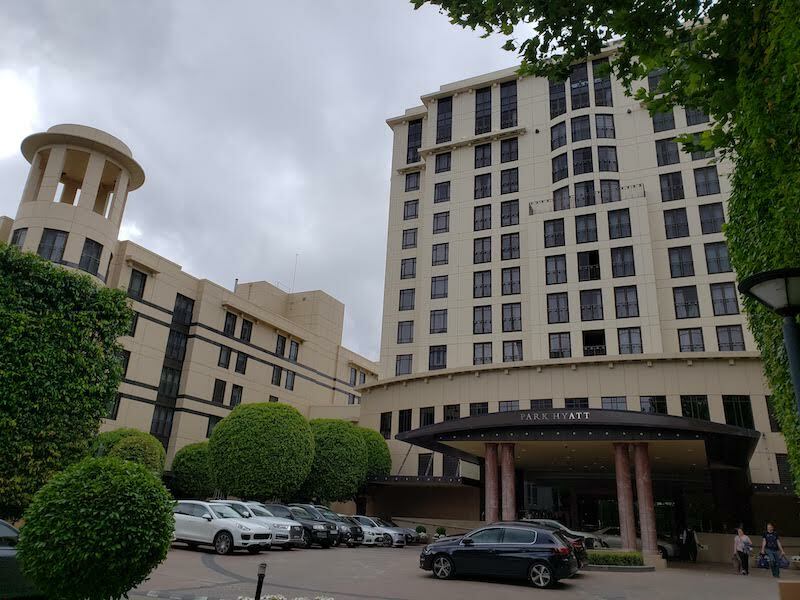 I have stayed at a number of Hyatt properties in Australia (there are currently seven) including the fantastic Park Hyatt and Regency in Sydney, Grand Hyatt in Melbourne, and Hotel Canberra. Without a doubt, the best Hyatt in Australia (if not the world) is the Park Hyatt Sydney. 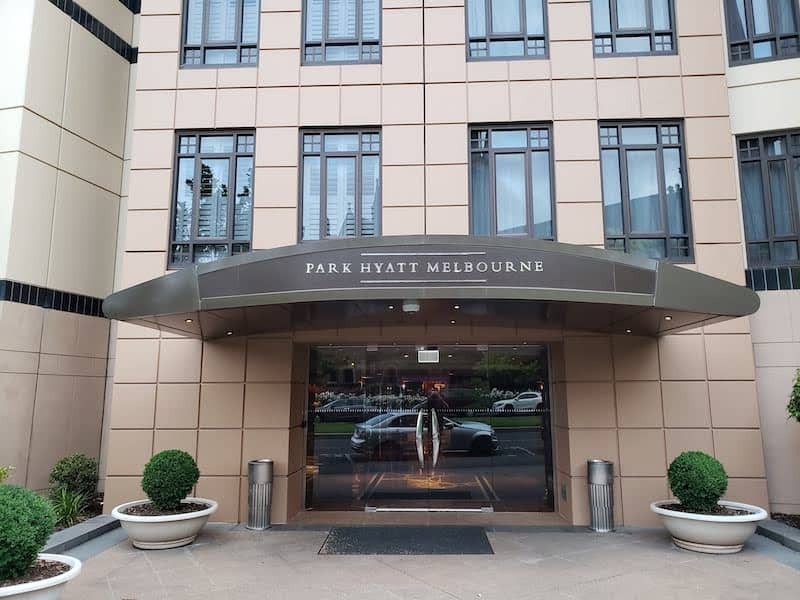 The last time I was in Melbourne I stayed at the Grand Hyatt as it is typically slightly cheaper (and less points) and more central than the Park Hyatt. 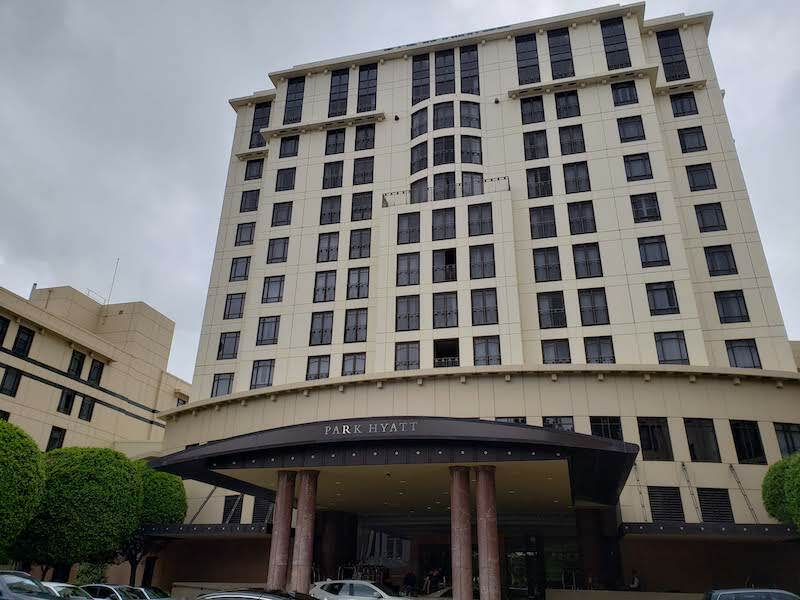 However, this visit I had just one night in Melbourne at the end of a trip to Australia and I wanted to try out the Park Hyatt. 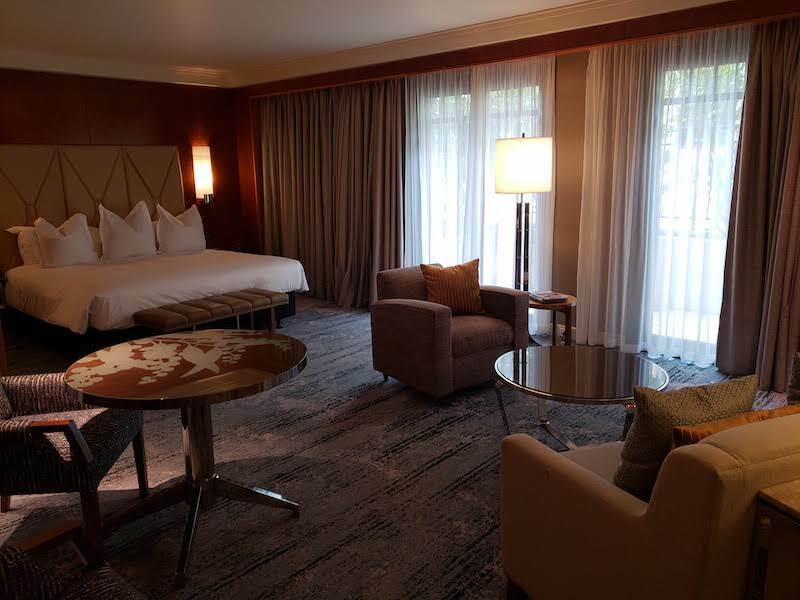 I booked my one night stay using Chase Luxury Hotel Collection. 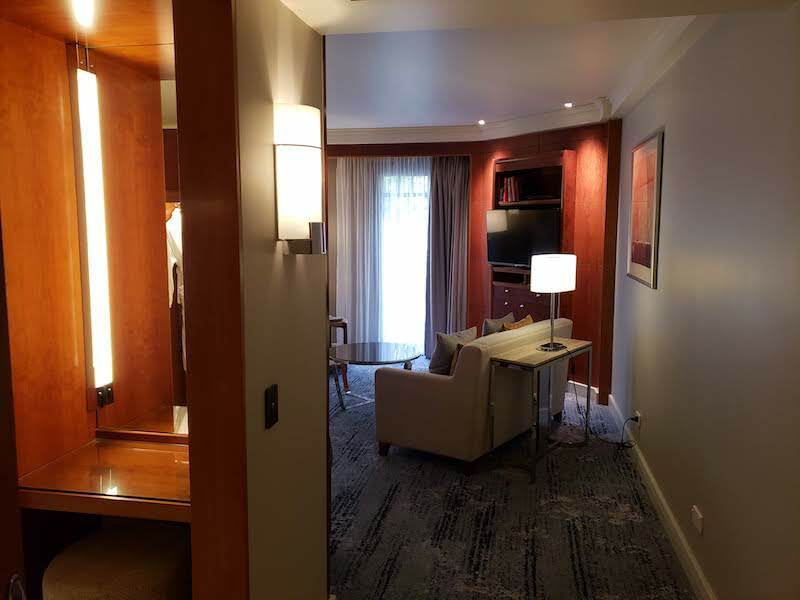 The Saturday night stay in November, 2018 was $365 AUD (or about $265 USD) and included $100 food and beverage credit plus free (cold) continental breakfast. 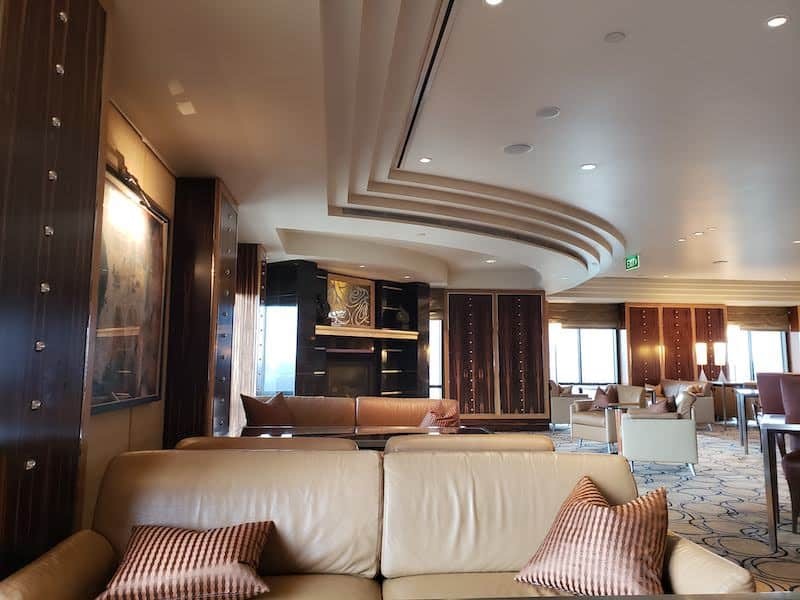 I also used one of my Club Access certificates as an Explorer elite so I could access the lounge during my stay. After arriving at Melbourne airport, I took the SkyBus to Southern Cross Station. From there I took a tram to Parliament Station (Stop 10) which is just outside the free zone. From there it was a one-block walk to the Park Hyatt. The area around the Park Hyatt is mainly government buildings and gardens. However, Collins Street starts just a short walk from the property. It really isn’t too far from the center of town. The gardens offer pleasant walks. I arrived around 2pm and was told my room wasn’t ready yet. However, the same room, three floors lower, was ready. I was told it was on the 9th floor so would have a less desirable view. As I was only staying one night, and three floors wouldn’t make that big a difference I thought, I said that would be fine. 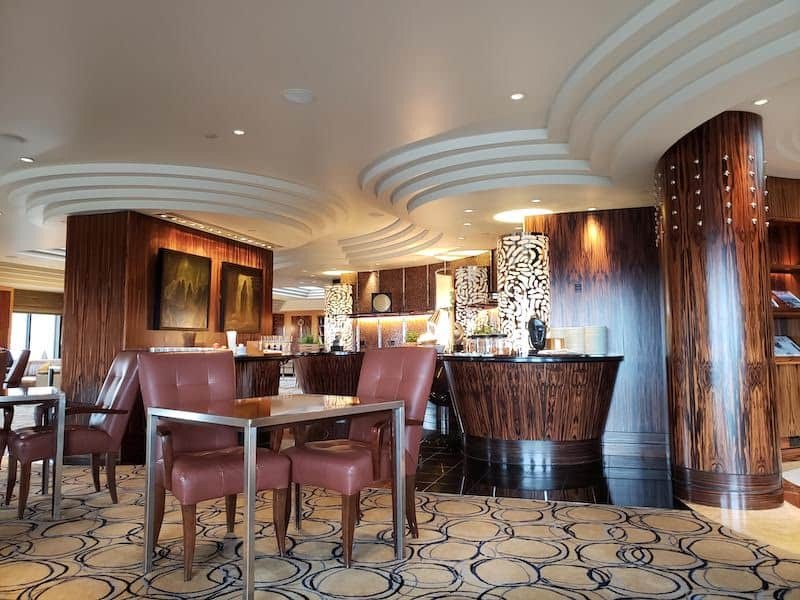 It was also explained to me that I had $120 AUD food and beverage credit (despite the website only saying $100) and continental breakfast available in the lounge or restaurant. I would need to pay the up-charge if I wanted a hot breakfast. 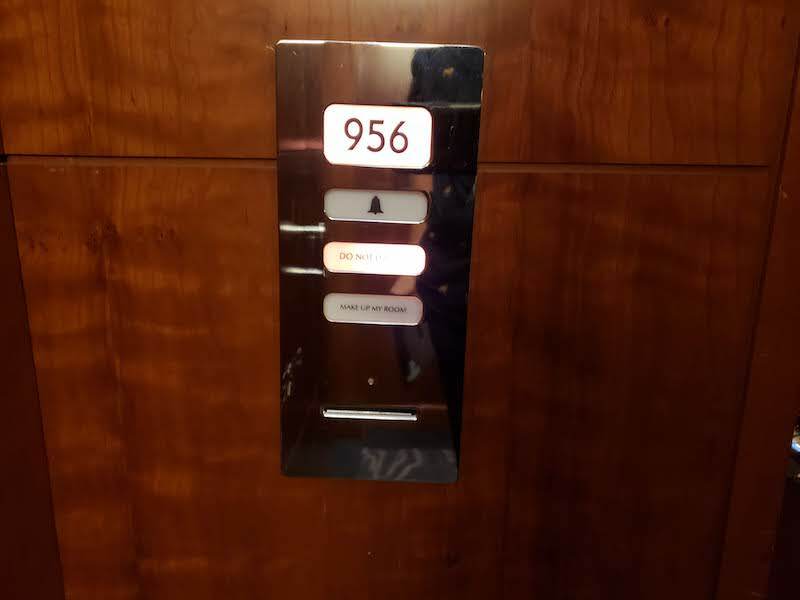 I headed up to room 956. The strange thing is that there are no floors between the lobby and floor 9. Floor 9 is actually the second floor of the building. 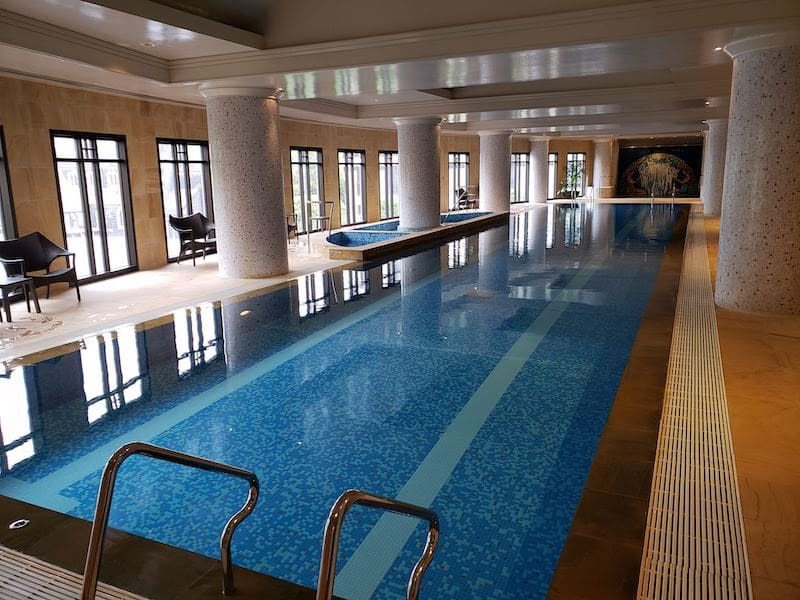 Besides about eight guest rooms, the floor also is where the spa and pool is located. 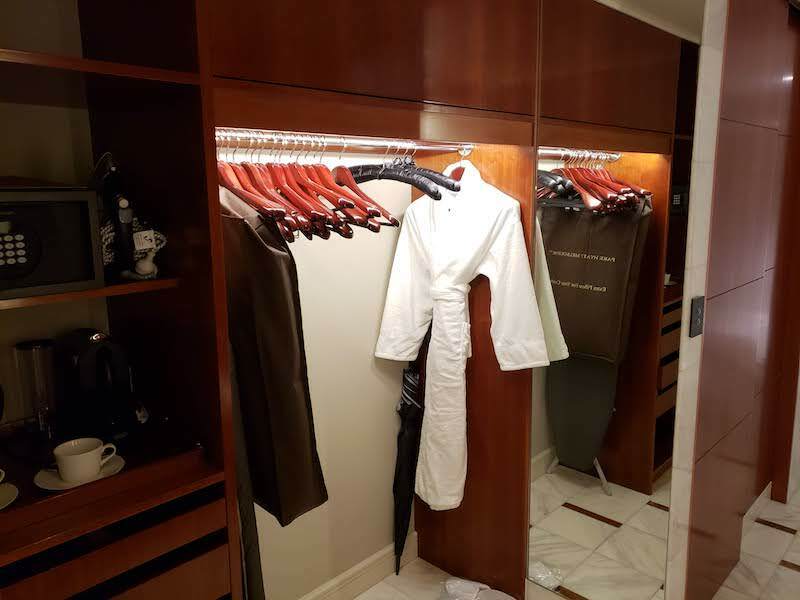 Booking through Chase Luxury Hotel Collection offers guests an upgrade subject to availability. 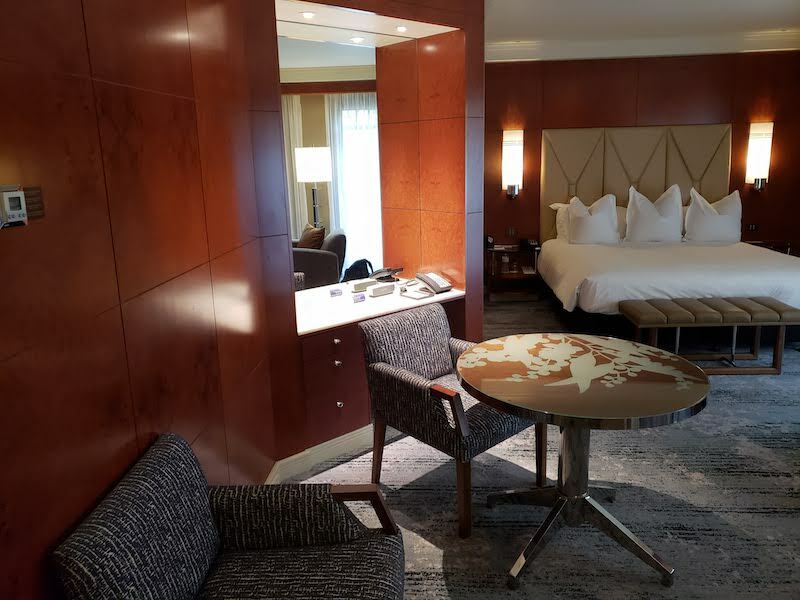 The room I received was indeed an upgrade, I believe it is the 1 King Bed with Club Access based on the hotel website. 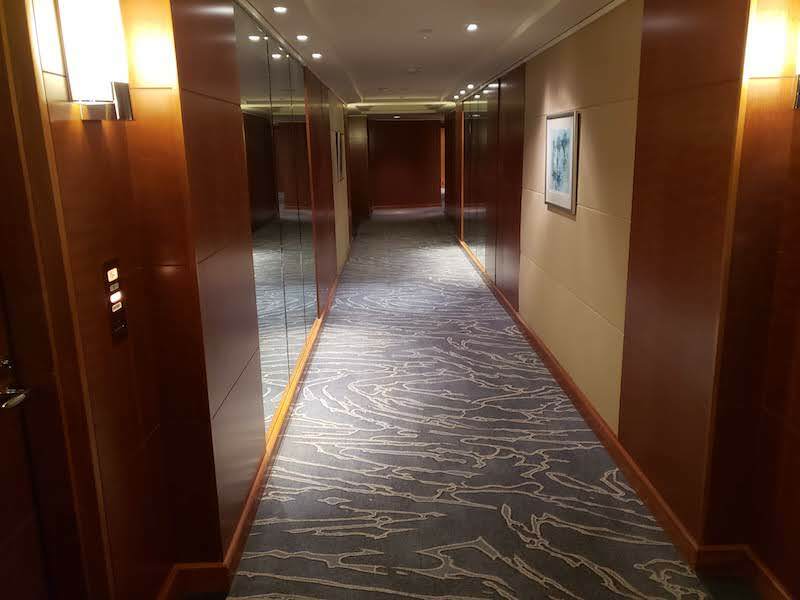 As you enter the room, the door to the dressing room is on the left and the living room area is straight ahead. 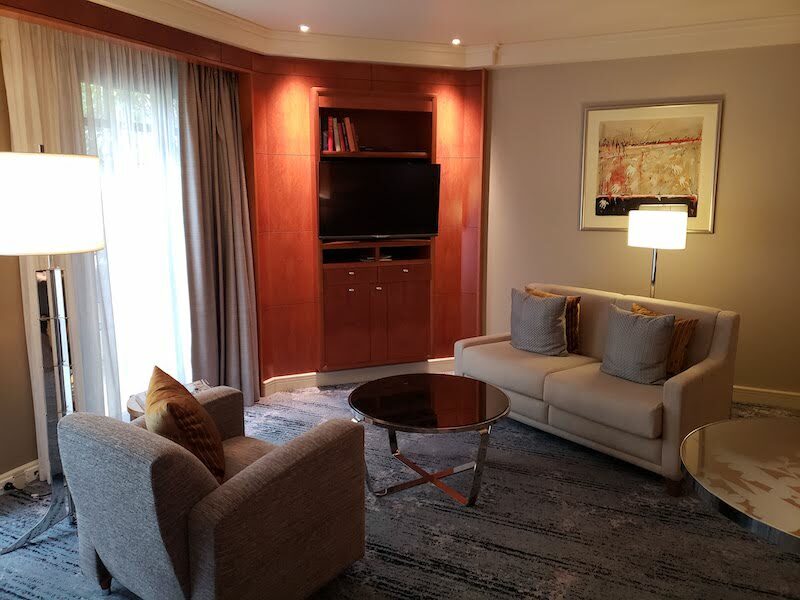 The living room area is open to the bed area, so it isn’t a suite, but still larger than a standard hotel room. A couch and chair with coffee table are in front of the TV and mini bar. Behind it is the desk and dining table. The bed is extremely comfortable with high quality sheets and pillows. The windows open up on to a terrace (the roof of the lobby). Unfortunately the terrace is walled in with the second hotel tower that is a good four stories high. So there are zero views in this room. I actually called down to see if I could switch rooms as I didn’t would have liked to see something other than a beige wall. The staff said they would get back to me but never did. I let it be; if I was planning on being there for more than one night I would have pressed for a change. 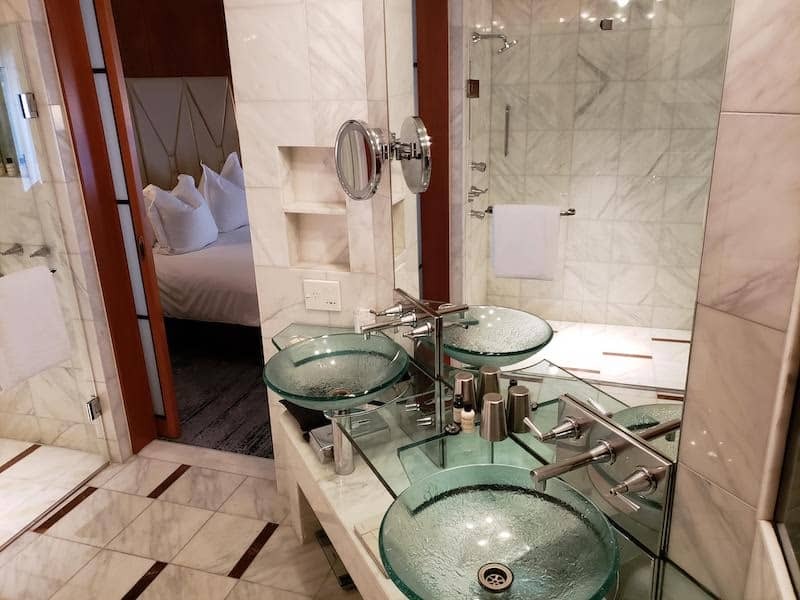 The bathroom is quite large. Larger than my entire hotel room at the Holiday Inn Express Brisbane. 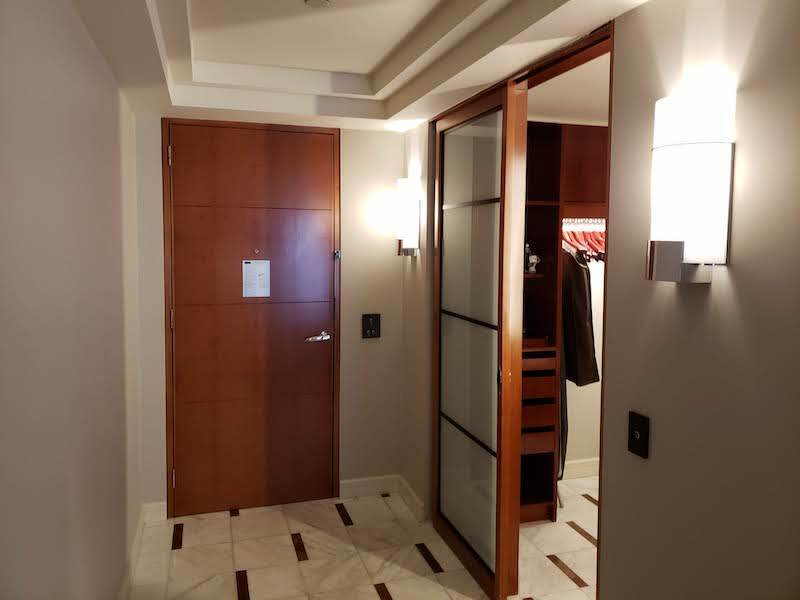 The bathroom is accessed through two doors; one off of the entry, the other from beside the bed. When entering from the entry, you are in the dressing room area. Behind the wood panels to the right in the photo below is the cube for the enclosed toilet. The rest of the bathroom is the soaking tub, shower, and double vanity. A TV is built into the wall next to the vanity. 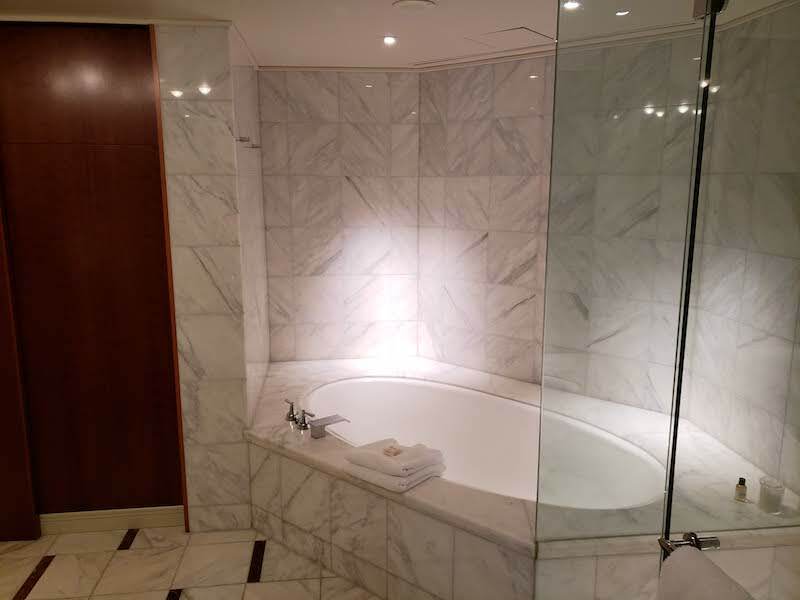 The tub is not jetted, however the shower does have two jet nozzles built into the wall (like you might find in a spa). 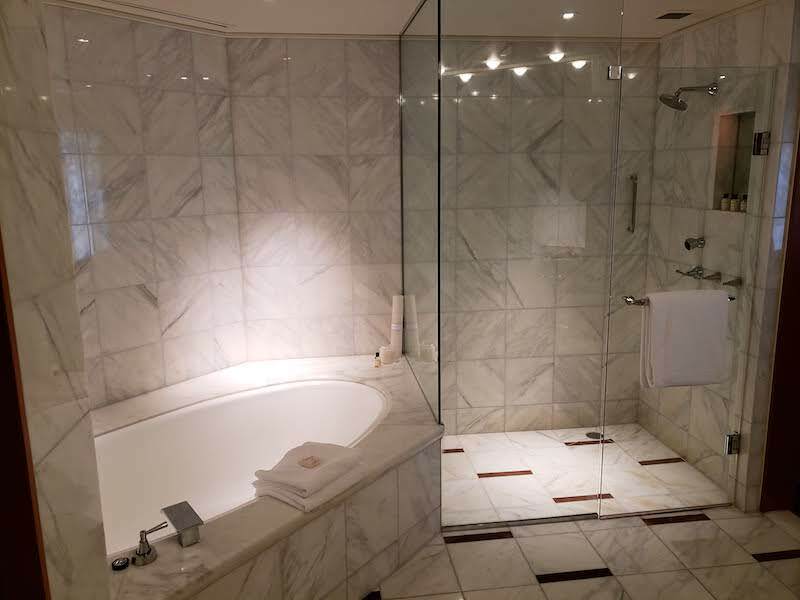 The bathroom feels very luxurious, though slightly outdated. 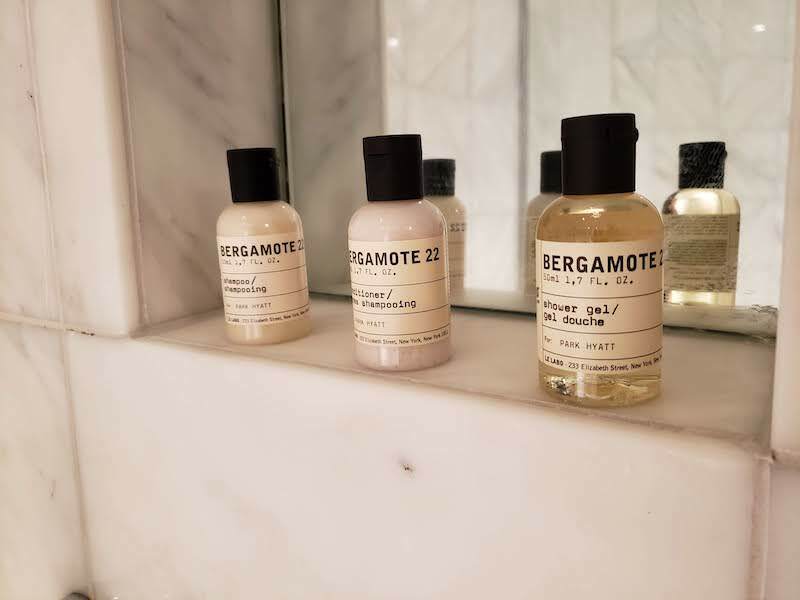 The bath products are all Le Labo, which is high quality but too fragrant for my taste. The pool and spa area shares the 9th floor. It is all indoor and far better than what the Grand Hyatt Melbourne offers. 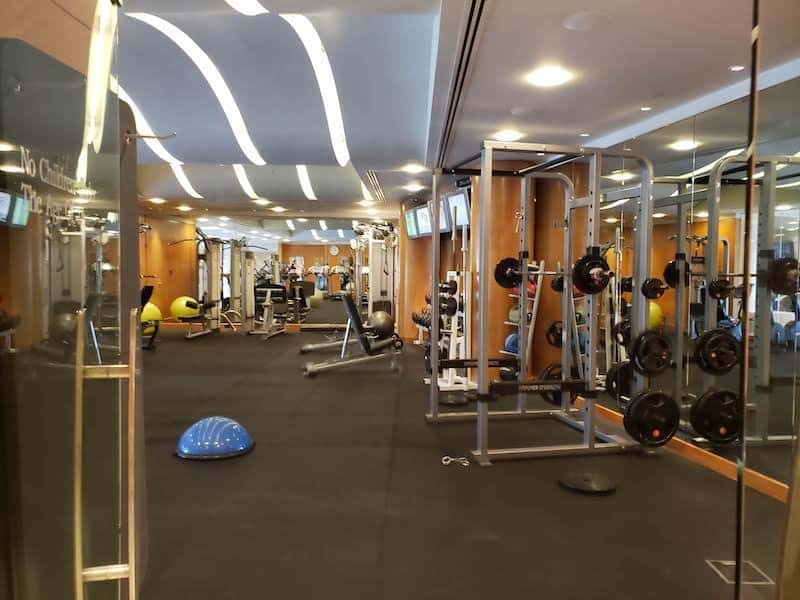 A large gym looks out onto the pool deck. The pool is quite long. There are two smaller pools that are essentially hot tubs with cold water. And there is a jetted jacuzzi hot tub as well. The locker rooms have saunas and steam rooms but they are basic (and needed some cleaning when I was visiting). 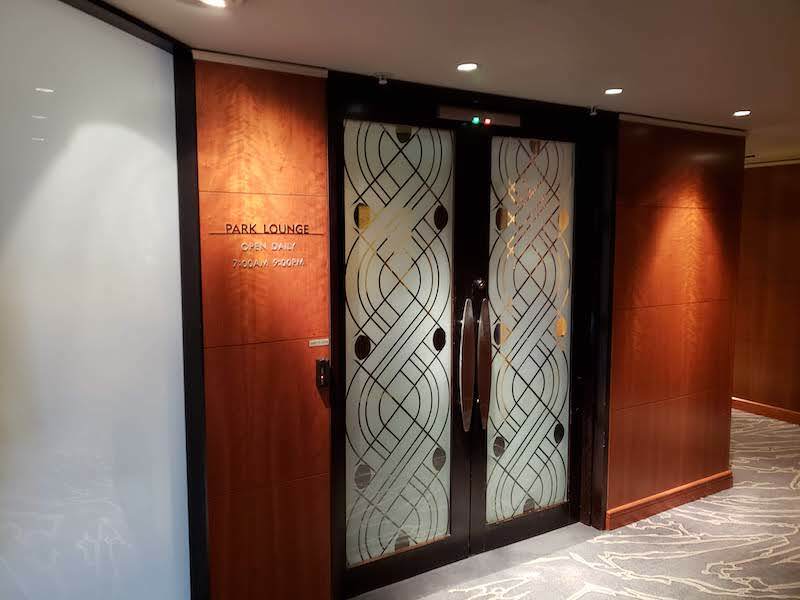 The Park Lounge is located on the “19th” floor (so more like the 12th floor). 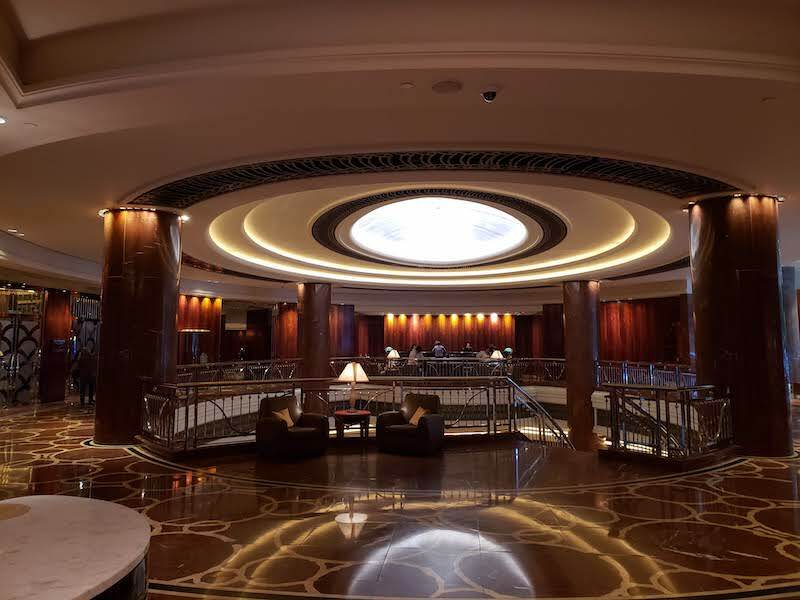 Unlike most Park Hyatt properties, the Park Hyatt Melbourne actually has a lounge. I found the food offering less than at the Hyatt Hotel Canberra. But at least they don’t have signs warning you not to take food out of the lounge. The decor seems slightly dated and overly opulent. 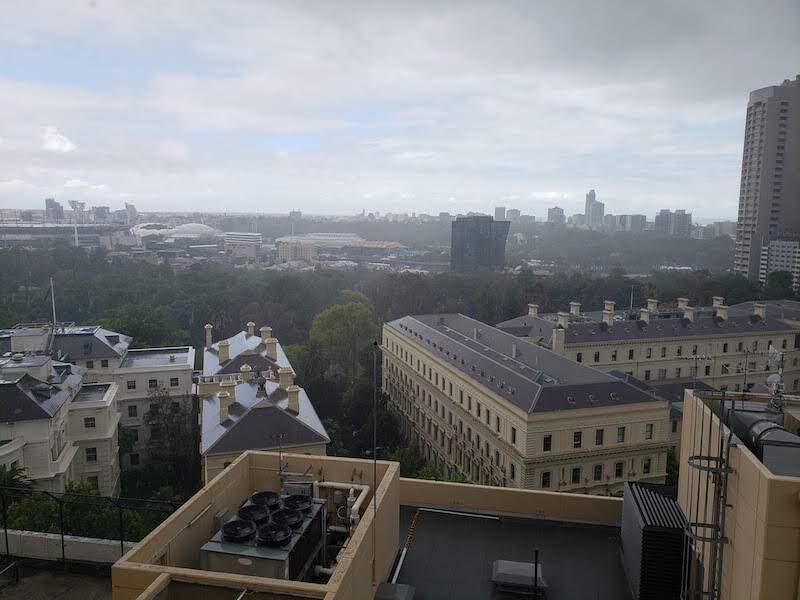 The views from the lounge are lovely even on a rainy day. 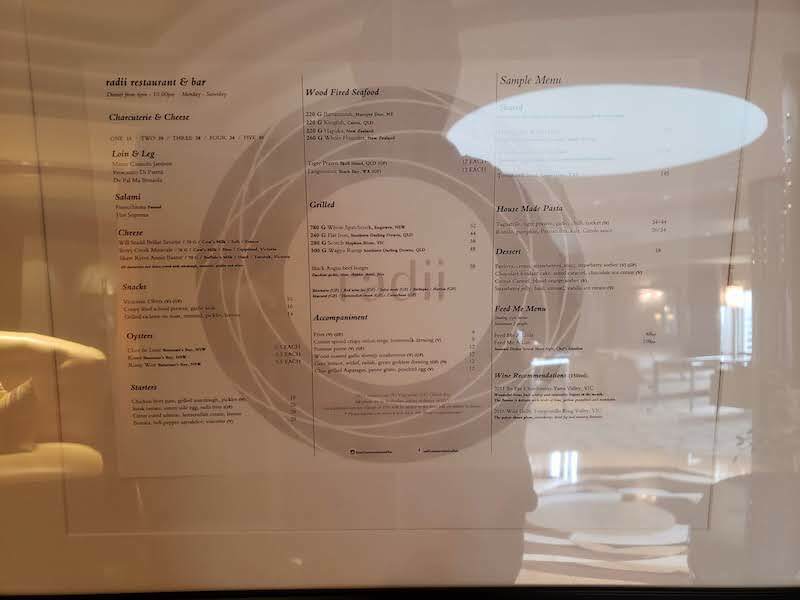 The restaurant in the hotel is radii and is located off the lobby. The food is the same on the room service menu. 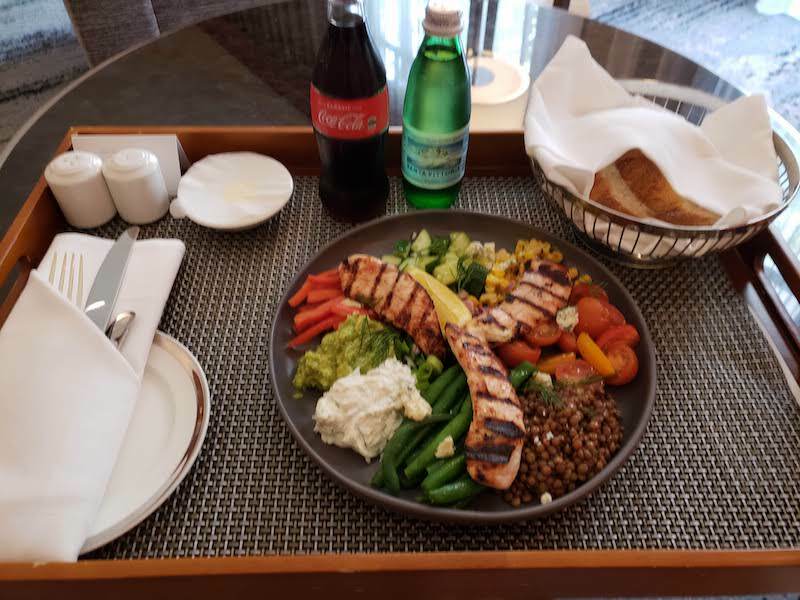 I decided to use my food and beverage credit on room service (both a late lunch and dinner). The prices are the same as in the restaurant and the hotel doesn’t have a surcharge on room service. I was quite happy with my “salad” (with no lettuce) for a late lunch. 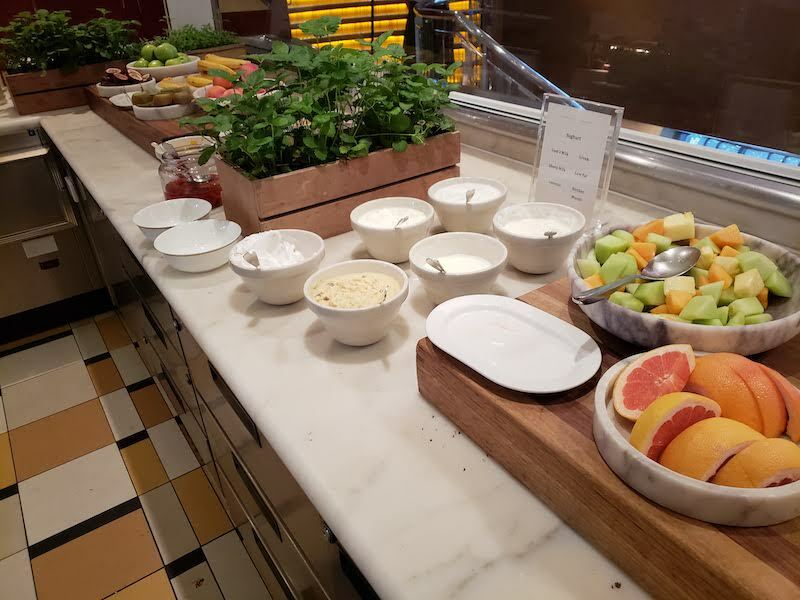 For breakfast I dined at radii which offers a buffet. I am not sure how much the up-charge for the hot breakfast is; my final bill wasn’t itemized — all the food was just just removed. Overall it is a standard breakfast buffet. If ordering the hot menu, you can have made to order eggs and omelets, waffles, pancakes and french toast. In addition, there are hash browns, sausage and a few other ready to eat hot items. 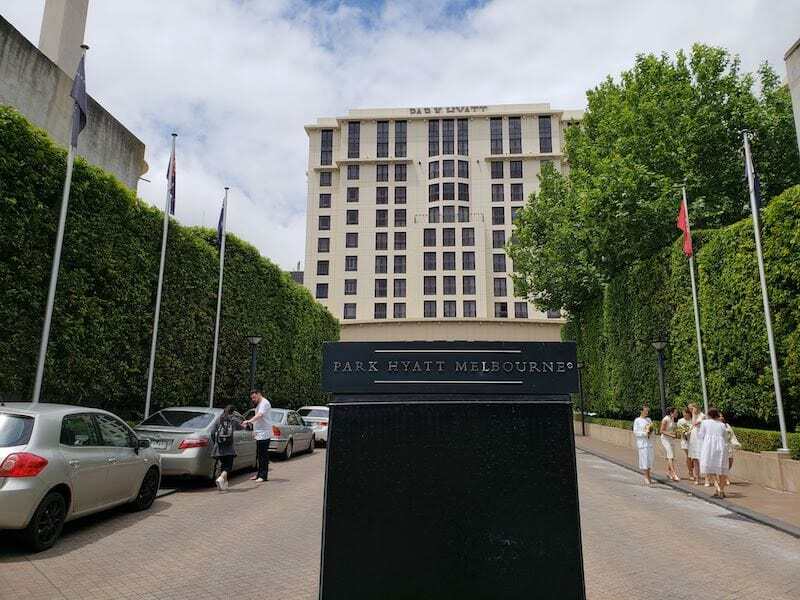 I found the Park Hyatt Melbourne to be a comfortable place to stay. The service had a few hiccups, including the front desk not calling me back and confused waitstaff in the restaurant. My room, while large, had a very disappointing view. If I had to chose between the Park Hyatt and Grand Hyatt in Melbourne, I would go with the Park Hyatt if they were roughly the same price.